You don’t need a special cone-shaped bag to package this dry herb mix attractively – just layer the ingredients in the corner of a sandwich bag, and attach one of our free printable instruction labels! This little parsley dill herb sachet makes an easy dip for a platter of mixed vegetables. Tuck it in as an extra time-saving treat along with a gift of cheese and crackers to provide a lovely gourmet touch with a homemade feel that you just can’t buy at the store. 1. Take a plain, clear plastic sandwich bag and fold back the top right corner diagonally across the bag, as shown in the photo at right. 2. Carefully pick up the bag, maintaining the cone shape, and open the top so that when you can add ingredients they will fall to the bottom of the cone. 3. Tuck the cone-shaped bag into a tall wine glass, as shown at right, to support it while you add the herbs. 4. Use a spoon or funnel to add the herbs in the order given. The layers may mix a little due to the flexibility of the bag, but you should still end up with the green parsley mainly at the bottom, and the lighter colored ingredients mainly at the top. 5. Gently grasp the outside of the bag, as close to the top of the herbs as you can, and lift the bag out of the wine glass. 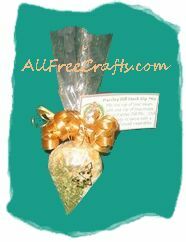 Give the bag a twist to contain the herbs tightly in the cone-shaped corner. Fasten with a twist tie. 6. Print one of the labels shown here. If you’re making more than one package of herb mix, you may want to print our multiple Parsley Dill Herb Mix Labels which has four of the Christmas designs and four of the parsley and dill designs. Alternatively, you could write a gift label of your own, including the directions for use. 7. Make a tiny hole at the left bottom corner of a label and thread a length of thin curly ribbon through the hole. Tie this to the top of the cone of herbs. Add a few more lengths of curly ribbon and curl the ends up tightly. 8. The leftover top of the bag will probably be too long. Cut this down to a few inches so that it looks more in proportion to the cone of herbs. 9. Finally, if you like, add a small festive sticker or two to coordinate with the color of the ribbon.